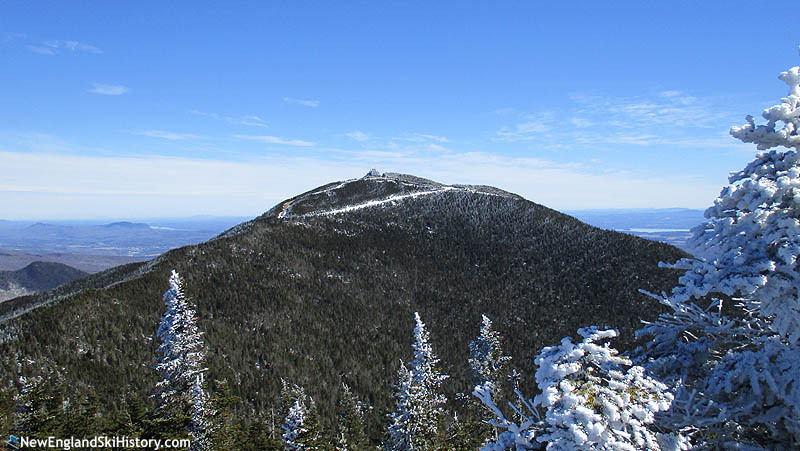 Located near the Canadian border, Jay Peak is one of the highest peaks in Vermont at 3,858 feet in elevation. 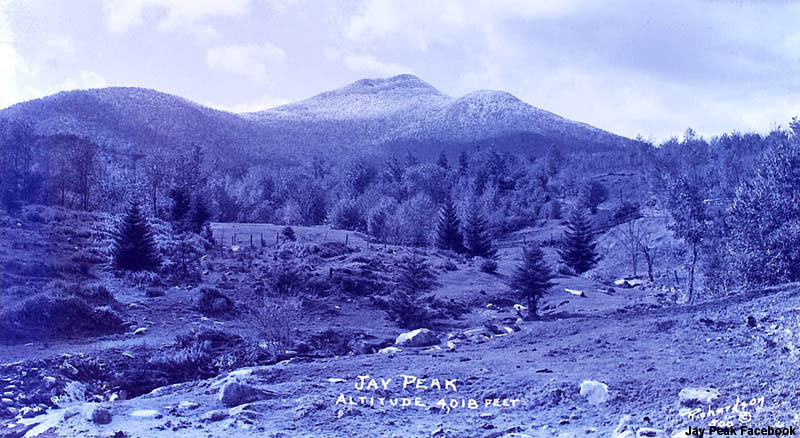 After years of attempts, a ski area on Jay Peak began to look like a reality as the Jay Peak, Inc. was formed in 1955. As part of a $250,000 development, a new Poma lift arrived on site from France in October of 1956. 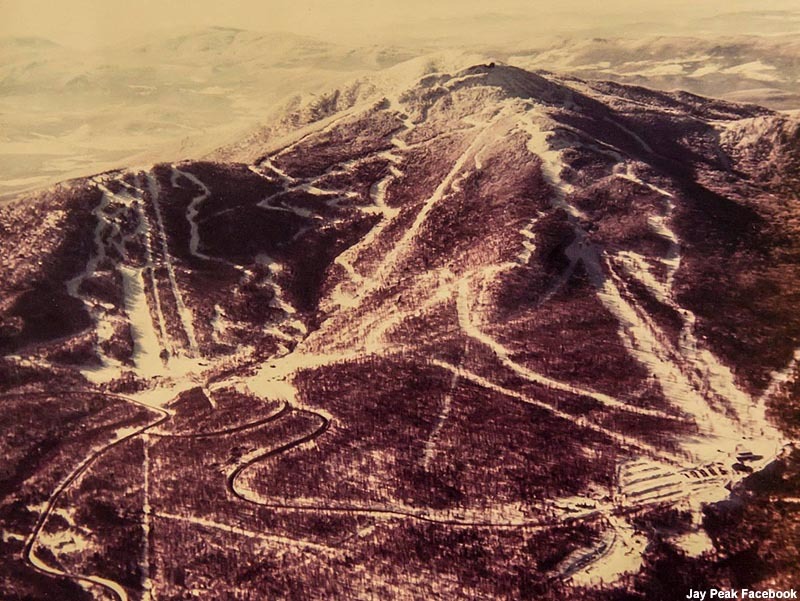 Centered around this development in today's State Side base, Jay Peak opened for the 1956-57 as a surface lift area. Don McNally, manager of a local drive in movie theater, managed the ski area, while Walter Foeger ran the ski school. Foeger's Natur Teknik would later spread to multiple ski areas throughout the northeast. The area found itself in need of more funds after its initial season, attempting a $30,000 stock sale to pay off debt and continue trail development. By the time its second season rolled around, the Poma lift had been extended (to an advertised 1,500 vertical feet), 5 trails were now open, and plans were developed for night skiing and a chairlift. 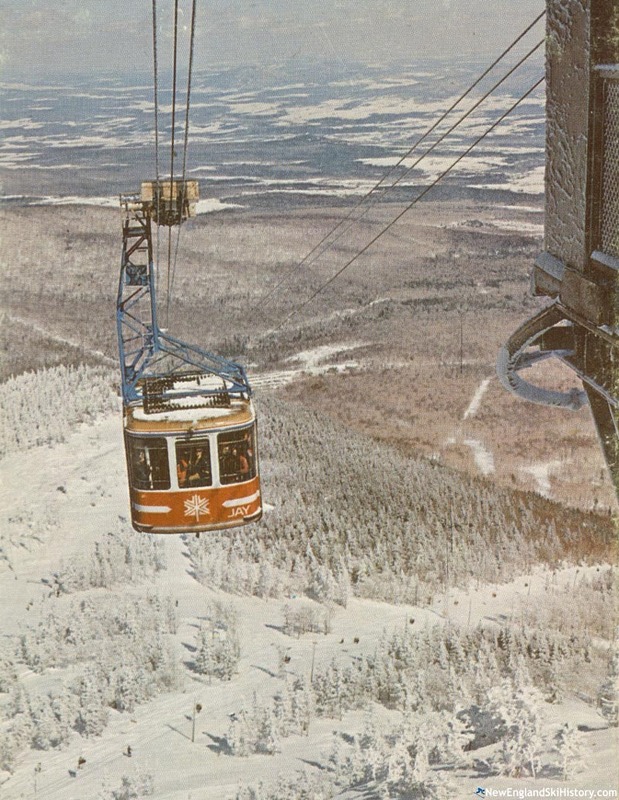 The 1960s would be a huge decade for Jay Peak, starting with the installation of its first chairlift, the Bonaventure, for the 1960-61 season. With this chairlift, Jay now sported a vertical drop of 1,700 feet. The summit was opened via an upper mountain double chairlift for the 1965-66 season, increasing the area's vertical drop over 2,000 feet. That January, shareholders of Jay Peak, Inc. agreed to sell shares to timber giant Weyerhaeuser Co., in order to finance a large expansion. Shortly thereafter, a $2.5 million expansion project was announced. The centerpiece of the expansion was a 2,050 vertical foot Von Roll tramway, which ensured major resort status. The 60-passenger tram was advertised as providing a 5 minute ride to the summit. In addition to the tram, a summit lodge was built, as well as a night club in the base area. Due in part to friction with the new corporate ownership, Walter Foeger formally left Jay Peak after the 1967-68 season and was replaced as ski school director by George Stepanek (who had developed the Natur Teknik ski school at Thunder Mountain, MA two years earlier). The Hotel Jay opened in 1974, providing 48 slopeside rooms for guests. Weyerhaeuser Co. sold Jay Peak to the owners of Mont Saint Sauver in 1978. In 1985, Mont Saint Sauveur International (MSSI) recruited Jack Frost General Manager Bill Stenger to run Jay Peak. In September 1996, MSSI announced its intention to sell Jay Peak. In November 1997, MSSI announced it had entered into an agreement to sell the ski area to Lifestyle Resorts International of Ontario, with Stenger remaining the resort's President. The deal fell through in January 1998 due to financing issues. Seeking to boost the resort, MSSI installed Jay Peak's first high speed chairlift in 1999, The Green Mountain Flyer. MSSI's principle shareholder Jacques Hebert passed away on March 17, 2006, resulting in even more pressure to sell Jay Peak. In December 2006, the $17.5 million Jay Peak Hotel Suites EB-5 project was launched. Under the EB-5 program, a foreigner can invest $1 million in an approved United States business (which must then create jobs), in exchange for a green card. With the Northeast Kingdom labeled a Targeted Employment Area, the minimum investment is cut in half to $500,000, making participating rural businesses such as Jay Peak more attractive. 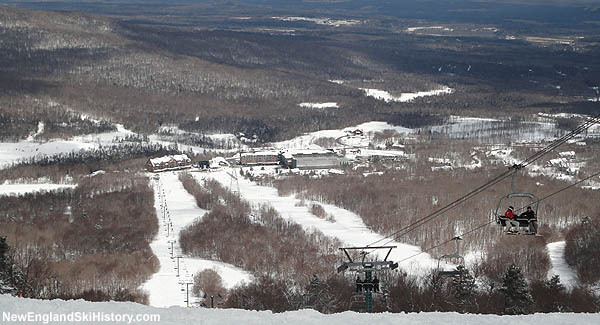 In 2007, MSSI reportedly reached an agreement to sell Jay Peak to Taihan Electric for $32 million, however the deal fell through. Stenger then reportedly urged Ariel Quiros to purchase the ski resort. Starting in January of 2008, Stenger operated Jay Peak for Quiros's Q Resorts while a final sale agreement was arranged. In June 2008, Q Resorts acquired Jay Peak for $15 million plus the assumption of $8.5 million in debt. As part of the agreement, Stenger would allegedly earn a 20% ownership stake after five years. With the EB-5 funds, a $120 million development was started. On December 18, 2009, Jay Peak's first big EB-5 project, the 57-suite Tram Haus Lodge, opened. The following June, the Ice Haus (an indoor skating rink) and Golf Clubhouse both debuted. Ground was broken for a new hotel and water park on July 7, 2010. That winter, Jay Peak added new snowguns and an RFID lift ticket system. In December 2011, Jay Peak held the grand opening for its new $27 million indoor water park, called the Pump House. The new Hotel Jay debuted shortly thereafter. In spring 2012, Ariel Quiros purchased Burke Mountain Resort. That off-season, a new learning center, magic carpet, and fixed grip quad were added at Jay Peak. Work commenced in the spring of 2013 on a new base lodge and chairlift in the Stateside area. While the chairlift was expected to be a high speed detachable six pack, plans were later scaled back to a slight relocation of the existing fixed grip quad. Phase 2 was later postponed. On April 13, 2016, the Securities and Exchange Commission took over Jay Peak, amid accusations that owners Ariel Quiros and Bill Stenger ran a Ponzi-like scheme that defrauded EB-5 investors. According to the complaint, some $200 million of EB-5 funding was misused. Following the SEC raid, the government installed Michael Goldberg as the receiver and Leisure Hotels and Resorts of Kansas City as the operator of Jay Peak and Burke. After the end of the 2015-16 ski season, the Vermont Passenger Tramway Division closed the Jay Peak Aerial Tramway, citing the need for repairs and upgrades. The lift reopened for the 2016-17 season and underwent a multi-million dollar renovation project in 2017. "My family, led by my dad Dr. William Towle, a Richford dentist, started skiing at Jay Peak in the mid-1960s, maybe even a bit earlier. My older brother Andy and I both raced for the Jay Peak ski team between about 1969 and 1972 as did some other Richfordites, most noticeably David Donahue during the late 1960s. Dave was one of the top racers in the state (also a terrific golfer) and went on to great success at the University of Vermont, where I believe he earned All-American honors as UVM emerged as one of the the top alpine teams in the nation. My younger sister Betsy Towle was on ski patrol at Jay Peak for a number of years. I quit racing after my sophomore year in high school because I just didn't like it that much, wasn't hungry enough to really care (I wasn't that good, haha) and preferred skiing recreationally. Several of my best friends from Richford High School also raced for Jay, including Mike Lavalla, Randy Kidder and Dan Kelly. During that time, we also became good friends with teammates who went to other area high schools, such as Ricky MacDonald and Mary Jo Frawley from North Country in Newport, and Dale and Dean Lumbra from Berkshire who attended Enosburg High School as well as some from the Montreal area, such as Ricky Watson, and Sandy Bonnell, and even from the NYC area (Bruce and David Green). One of our other teammates was Kenny Sowles from the Burlington area, who years later became an agent for some of the USA's top skiers, such as Bode Miller. The Greens owned a ski lodge near Jay and drove up from the NYC area every Friday night so Bruce and David could practice and race along with everyone else. One of my favorite Jay Peak memories was the year before I joined the ski team, when I was among a handful of experienced skiers looking to get even better who took semi-private lessons from gold medalist Anne Heggtveit Hamilton, who had won women's slalom gold at the 1960 Winter Olympics in Squaw Valley and was also a double world champion that year. She was a terrific instructor and one of the nicest people I ever met skiing. In all my years as a sportswriter later on in life, I met dozens of world-class athletes in various sports, and no question Anne ranked at the top of the list in terms of humanity and personality." "My first time skiing was a year out of college at Jay Peak. Since my buddy saw me outside all winter long, he assumed I knew how to ski and sent me up a chair lift to wait for him while he gave a first-timer some pointers on the bunny slope. The only run off the chair lift was an ice-covered diamond.....oh boy, that was a trip down the mountain I will never forget. I am stubborn and made it a point to make a bunch of runs on my first day. Since then, I have seen the best of Jay.....great deep powder days, the Jay snow vortex dumping powder several days in a row. I introduced my 2 sons to Jay at an early age and hope they do the same with their kids." "There was a reason it was called the 'Jet' t-bar...that thing would literally launch you off the ground at the start. If you were lucky enough to make it to the top, then you survived a trip up that was just as thrilling as a run down. Gave a small kid like me a nervous scare and a great sense of accomplishment-which is want skiing is all about, isn't it?"